Taiwanese actress Shu Qi made the case for pure drama at the Armani Lipstick Maestro event in Taipei, Taiwan on Thursday (July 13). 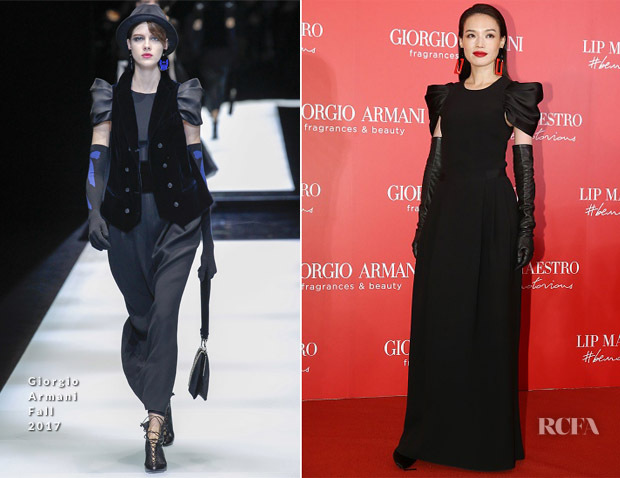 Donning a Giorgio Armani Fall 2017 pouf-sleeve gown and opera gloves, she took the original runway variation and modeled it with a different form of theatrical glamour. By virtue of wearing this dress in monochromatic black, she allowed its shape and statement sleeves to command the sophisticated elegance they deserve. But, as this was a lipstick event, her perfectly, bold-red pout had just as much of a starring role, with her fascinating geometric earrings enhancing it all the more.